On the British sci-fi show Dr. Who, you never really knew where the Doctor and his companions were going to land next thanks to their time-traveling police box known as the TARDIS (short for Time And Relative Dimensions in Space). That bright blue police box has become an iconic part of science fiction lore, a classic television staple, and now, it’s a prank. 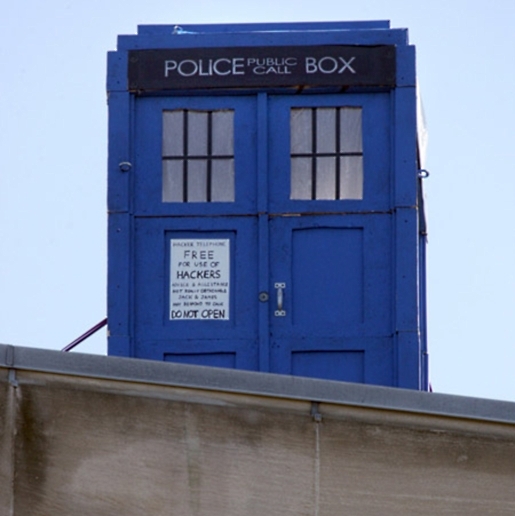 The MIT hackers placed a big blue TARDIS on top of Building 10 at 77 Massachusetts Avenue overnight as part of their yearly prank tradition. The TARDIS is definitely a nod to both Dr. Who and its status as a telephone. Indeed, this particular Tardis is decorated with a sign reading “Hacker Telephone–Free for use of hackers.” Every year, the hackers put something on the domed roof of MIT’s Building 10, and this year they decided to get a little British with it. Here’s my question. Which part was harder? Finding a police box, or getting the police box onto the top of the dome?